Mali Mish – A Look at Our Solar Charging System (Video). During our last visit to the shop, we asked the guys at C & G Trailers to install our solar system for us. But rather than buying a complete turn-key solar system, we did some shopping around and put together a basic system of our own. As some of you who have solar systems, or have looked into them, might know that it is an expensive investment. But the benefits of having a solar array charging silently away at your batteries are truly magical. 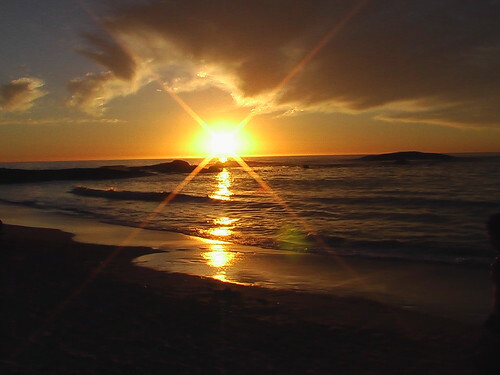 Unlike generators that need to be refueled and maintained, solar panels last practically forever. They have no moving parts and require no regular upkeep. The fact that they turn our abundant sunshine to usable energy stored away in our RV batteries for later use is a modern day miracle. As opposed to charging your batteries using an AC extension cord, a solar system bypasses the inverter and charges the batteries directly. That means there is no energy lost during the AC to DC conversion. It is very efficient and obviously an environmentally friendly alternative. Something every solar system should also have is a good quality charge controller. A charge controller monitors the level of charge you have in your batteries and provides the right amount of voltage going into them so they do not get damaged. In a pinch, you can wire solar panels directly into your 12-volt batteries but you are taking the risk of permanently damaging your cells. A high quality, modern charge cotroller should also be of the MPPT variety. That stands for Maximum Power Point Tracking. As compared to the traditional PVM (Pulse Width Modulation) charge controllers, the MPPT controllers will maximize the amount of amperage and voltage coming into your system and can generally give you a 10-20% boost in the number of amps you are putting back into your system. Think of that as similar to getting 10-20 percent more watts in your solar panels which can mean a pretty significant cost savings. When we installed our solar system, we purchased the parts individually buy finding the parts we wanted. To be able to completely replenish the batteries daily in an Airstream of our size, we would need at least a 200-watt system. We typically do not boon dock for more than a few days and did not see the need to install such a large system right away. You will also need to carefully consider the size of the panels as they need to fit the space constraints of your roof. We started with just two 50-watt panels that fit nicely in front of the AC unit. Using the existing solar wiring from the factory, we asked our friends at C&G Trailers to mount and wire the solar panels. 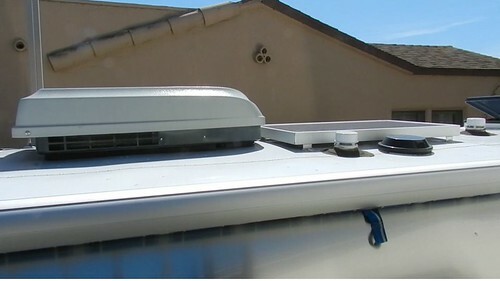 Instead of purchasing and installing a complete system, which would have cost close to $2000, the installation of the panels was only a couple hundred dollars. A new set of wires were connected to the batteries and both were lead out to the space directly above the TV and behind the fridge. 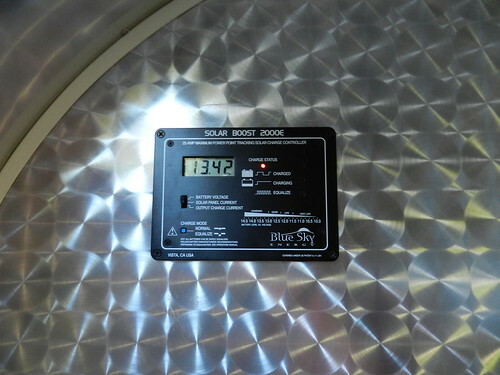 To complete the system, I purchased a Blue Sky 2000E MPPT Solar Controller from an online retailer and carefully cut out the space required to install the panel. 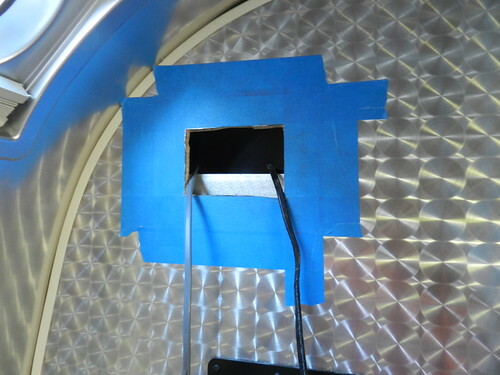 I taped the area with blue painter’s tape during the cutting process to avoid scratching the surfaces around it. After first testing and then connecting the wires, we were in business. Here is a video of how the system works in a sunny afternoon. We are so far very happy with our solar charging system. It will not completely eliminate the need for our generator or electrical hookups but it keeps our batteries nicely topped off when she isn’t being used plus we now have the luxury of not having to run our generator every day when we are boon docking. With the way we installed our system, we spent a fraction of what a turn-key system would have cost and still have room to upgrade to more panels in the future. Our total cost of the system came to just about $700. $350 for the solar panels, $200 for the labor and parts of mounting and wiring by C & G Trailers and $150 for the charge controller. That is 1/3 of what a system like this would cost if bought as a package. 8 Responses to A Look at Our Solar Charging System (Video). Thanks for sharing! I’m interested in having a solar system on our RV as well to reduce the need to run the generator. I like the charge controller. Hey, great to see you have installed your solar system! You didn’t mention in your video how many amp hours o f usable power you have in your batteries when fully charged…..just curious. We went the conventional route and bought a package from A.M. Solar (Oregon) and then contacted one of their mobile installers to install the system. As you know we’ve got a 30 year old rig, and running cable presented some interesting problems, requiring some creative solutions. I am really glad we had professionals install it. I’m sure I could have done it, but it probably would have taken a month of Sundays….it took the professional 3 days! It did cost close to $3,000 for everything, however, we have installed 2 150 watt panels along with the Blue Sky charge controller and Blue Sky charge monitor. We have 2 8d truck batteries for house batteries providing 540 amp hours, so we have 270 usable amp hours. We found the same thing you did, that if we manage our power consumption we can go a day, or two without running the generator. Since we are on the move every few days we usually get back to 100% while driving since our alternator is putting juice back in along with the panels. We are stilling learning how to manage our system, but it is great not having to rely upon a traditional power source, or run the generator. Congrats!!! Hi Clarke, our electrical system is meager as compared to a Class-A motorhome. It has 2 group 27 batteries for a total of just 170 Ah. We are hoping to add a couple more batteries and maybe another 100-watt panel in the future. Hope you guys are enjoying your life on the road. Chris, thanks for your comment. It is a great investment. I am glad I was involved with at least part of the installation. Look forward to seeing how well the system works while you travel. Thanks for sharing. Well said, but everyone needs to realize that adding Solar in their house is an asset that could improve the future worth of their home if / when they make a choice to sell. With the environment the way it is going we cannot ignore any system that supplies totally free power at no cost to both the shopper and more significantly the world! When you guys are on the road and doing a lot of boondocking are you running your fridge off of propane? I’m assuming a family like yours has milk and other items that need to stay cold. If you are mainly using solar I was wondering how you were keeping things cold and how long your fridge runs on propane. I’ve been considering adding a solar system to my rv but was curious as to what most did with their perishables eapecially if you were dry camping a lot. Hi Jeremy, yes we run our fridge off of propane and it works great. it takes about 1 lb of propane (roughly 1/3 of a gallon of LPG) per day. We carry 2 30 lb propane tanks so it goes quite a long time. Our furnace heater uses way more propane than our fridge does. When it runs on propane it still requires some 12 volt electrical current but I think it’s just an amp or two at most.